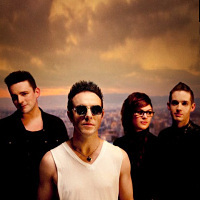 Glasgow Eastenders, Glasvegas, are marking their grand return in the spotlight with an extended UK tour. After their acclaimed eponymous 2008 debut, epitomised by the radio-friendly, 'Geraldine', the Allans cousins and their mates are soon to release their sophomore album. 'Euphoric Heartbreak' (see the subtle oxymoron here) is due out on 4th April, off of which 'The World Is Yours' is available for free download from their website (www.glasvegas.net). The first actual single, 'Euphoria, Take My Hand', was released on download this month, and will hit the stores on 28th March, following the first leg of their UK tour which will stop by Edinburgh, Glasgow, London (at Heaven), Portsmouth, Bristol, Wolverhampton, Bolton, Wakefield and Sunderland, between 1st and 27th March; before sharing their Glaswegian euphoria with the crowds of Belfast, Liverpool, Newcastle, Manchester, Cardiff, Bournemouth, Birmingham, Nottingham and London again (with two shows at the Forum), between 23rd April and 11th May. With the heavy forecast, courtesy of NME that "if the Libertines defined the start of the [last] decade and Arctic Monkeys its middle, then Glasvegas [were] almost certainly going to define its end and beyond", let's see where this new one takes the quartet to. While most of March shows have now sold out (with the exception of Portsmouth and Sunderland, respectively on the 23rd and 27th), tickets for April and May go on sale this Friday 18th at 9am, priced at £15 to £16 regionally, £17.50 for London.